New and experienced dancers welcome! There is parking at the Community Centre and the railway station is across the road. The club has held dance workshops since 1987. Dances taught range from the Oxford Waltz and Clare Lancers Set to the swing and tango. A number of bands and musicians have been eager to provide live music for the workshops, including members of the Southern Cross and Ryebuck bands, who have many years experience in folk music. Specialist teachers encourage dancers to improve their technique and exchange knowledge with other callers and musicians. 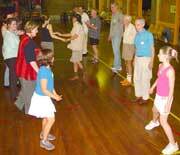 The emphasis is on teaching new dances and expanding the repertoire for Saturday night dances, balls and contra dances. In 2004 a group of dancers from Pennant Hills demonstrated winners from Dance Writers’ Competitions, at the Illawarra Folk Festival, as part of the BMC Golden Jubilee celebrations. Studies have proved that dancing is an excellent way to maintain mental alertness and physical health (see Cornstalk, September, 2004).